PHILADELPHIA, PA – October 12, 2017– Janney Montgomery Scott LLC (“Janney”), a leading full-service wealth management, financial services, and investment banking firm headquartered in Philadelphia, PA, announced the hiring of a local team entrusted with $350 million in client assets. 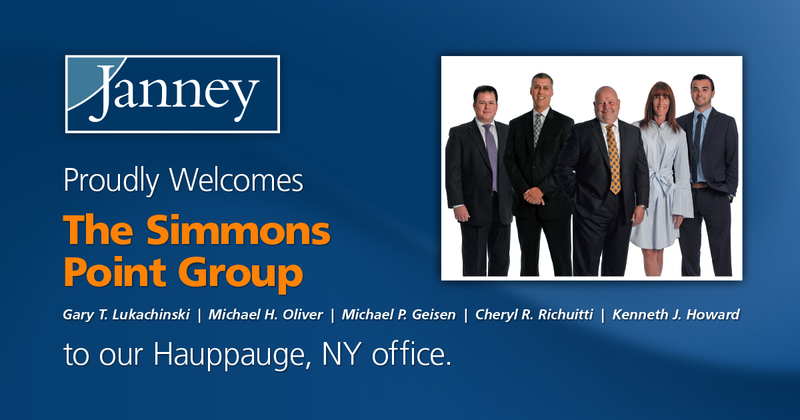 The Simmons Point Group, led by Gary T. Lukachinski, Michael P. Geisen, and Michael H. Oliver will be based out of Janney’s Hauppauge, NY branch office. They were formerly affiliated with Morgan Stanley. Gary T. Lukachinski, CFP®, Executive Vice President/Wealth Management – Gary is a 29-year industry veteran. He is a Certified Financial PlannerTM and member of the not for profit Financial Planning Association, as well as its local Long Island chapter. Gary holds degrees in electrical engineering technology and business management and economics. Michael P. Geisen, Financial Advisor – Michael graduated from St. Joseph’s College with a Bachelor’s Degree in Business and has worked in the financial services industry since 1994. Michael H. Oliver, Associate Vice President/Wealth Management – Michael has over 18 years of financial services experience. He has completed his MBA and is currently pursuing the CFP® certification. He serves as Director of the North Fork Lacrosse Club. Cheryl R. Richuitti, Private Client Assistant – Cheryl attended Fairleigh Dickenson University and has over 25 years of experience in the financial services, technology, and electrical industries. Kenneth J. Howard, Private Client Assistant – Kenneth graduated from St. John’s University with a degree in Finance and assists the team with market and economic research. Janney’s Hauppauge, NY branch office is located at 888 Veterans Memorial Highway, Suite 505, Hauppauge, NY 11788.